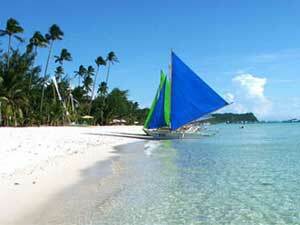 Philippines Best Beaches. 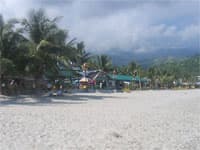 Beach Resort Holidays in the Philippines. 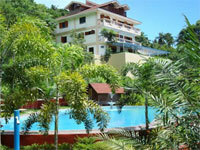 Book Beach Resorts and Hotels as part of your Philippines Vacation. Our knowledgeable staff are waiting to create your perfect Philippines Beach Break or a Tour to include the best beaches of the Philippine islands! The Philippines is blessed with so many beautiful beaches, it's perhaps difficult to know which to visit first. As well as lively Philippines beach options, there are also numerous islands where you can still find solitude whilst enjoying the soft sand and crystal clear, warm waters. Take a look at our top Philippines Beach Holiday suggestions below. Remember, we take care of all pick-ups and transfers, to ensure your Philippines vacation goes smoothly. Hailed by TripAdvisor as the No.1 Beach in Asia, (No.2 in the world), Boracay proudly boasts of its four-kilometer White Beach with its ultra-fine white sand. There are lots of activities tourists can do in Boracay, ranging from planned activities by the many resorts, indulging in spa treatments, or scuba diving and mountain trekking. Activities both for the adventure seeking tourist and those looking for a relaxing time out are available at this beach. Boracay really comes alive at night. The strip alongside White Beach turns into one big party venue and tourists can enjoy all kinds of dining options as well as numerous cafés and bars. Accommodation options range from hotels from standard to luxury, as well as self-catering suites. There are some quality tourist resorts along Alona beach, on Panglao Island, Philippines, including some where the highest standards of comfort, accommodation, and dining are on offer. Discover the enchanting features of this beautiful part of the Philippines. Panglao Island is attached to Bohol by a short bridge, and is a favorite destination of tourists, with its white sand, cool crystal blue waters, snorkeling and dive sites, and general tropical tranquil ambiance of the place. 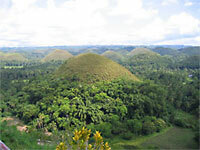 Visit Pamilacan Island to enjoy dolphin and whale watching, and mainland Bohol for the Chocolate Hills, Loboc river, and many other attractions. Located in Palawan, El Nido is one of the top tourist destinations in Palawan, and is often referred to as the Philippines' "Last Frontier". El Nido offers several great beaches, which is a great escape from the busy urban life. Aside from the beautiful white sandy beaches, El Nido is a great place to see beautiful seascapes, a variety of tropical birds, enchanting lagoons, lush jungle, and towering marble cliffs. Boat Tours are a great way to explore the nearby islands of Miniloc, Vigan, Pinaglugaban, Snake Island, Dilumacad and many more. NEW! El Nido now has direct flights from Manila, Boracay, Puerto Princesa, and Cebu! Puerto Galera is easily reached from Manila, and getting there requires no internal flights. This is one of the Philippines' most popular holiday destinations, due not only to its relative close proximity to Manila, but also because of the numerous beautiful sandy beaches surrounding the town, especially at White Beach, and Sabang. 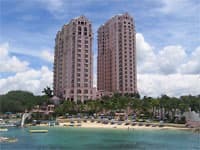 To the east of Cebu city lies Mactan Island, and here you'll find a variety of hotels with their own private beaches. 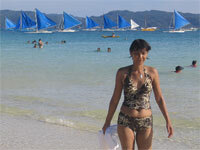 Perfect for a Philippines Beach Break or perhaps a longer holiday on Cebu. Enjoy watersport activities, or simply relax on the beach and let the cares of the world go by. Samal Island, with its numerous white sandy beaches, and tourist resorts, sits amid the warm waters of Davao Gulf, just off Davao. The island is rich in coral reefs, ideal for scuba diving and other aqua sports, such as snorkeling and sailing.